August 18, 2017 – Colorado astronaut Jack Fischer and his Expedition 52 crew mates on the International Space Station are preparing for the 2017 Total Solar Eclipse on Monday with the chance at several unique views of the event. 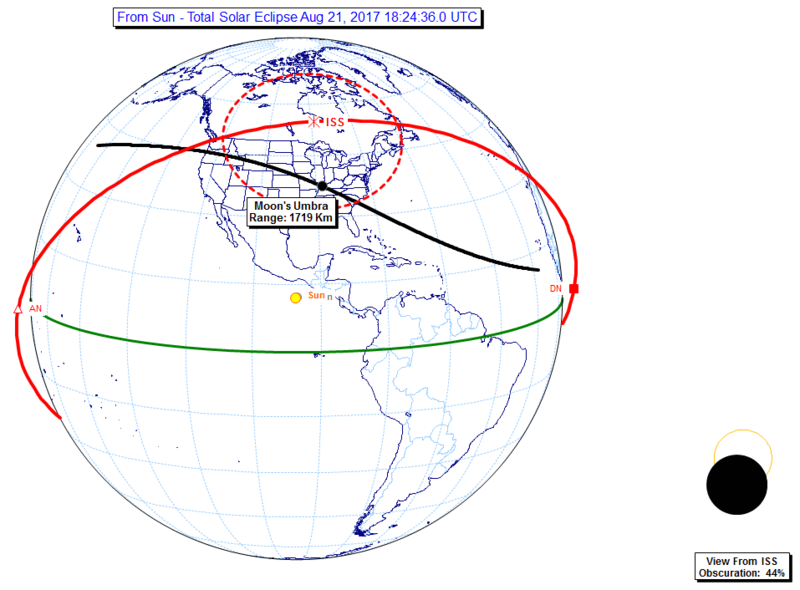 It’s anticipated that for the August 21, 2017 total solar eclipse, at least some part of the lunar shadow passing over Earth’s surface will be visible by the ISS astronauts. 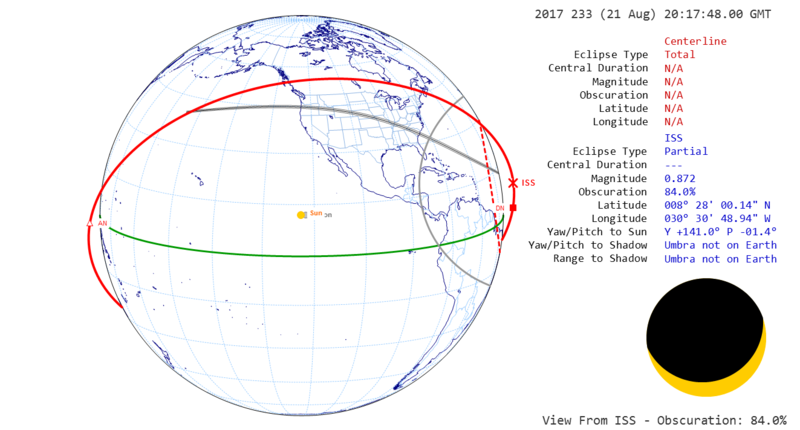 In fact, the ISS should see both a partial eclipse (when far from the path of totality), and the shadow of the moon on the ground (when close-by). Station crew members will have their cameras outfitted with special filters on Monday for three chances to photograph the solar eclipse from windows aboard the orbiting laboratory. 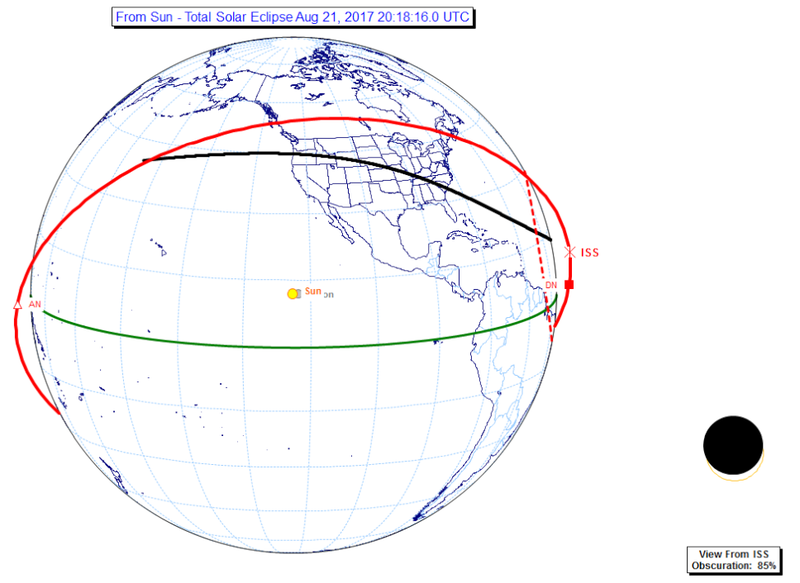 During the first pass through the Moon’s penumbra, ISS will experience a partial solar eclipse with 37% of the Sun covered up at maximum. 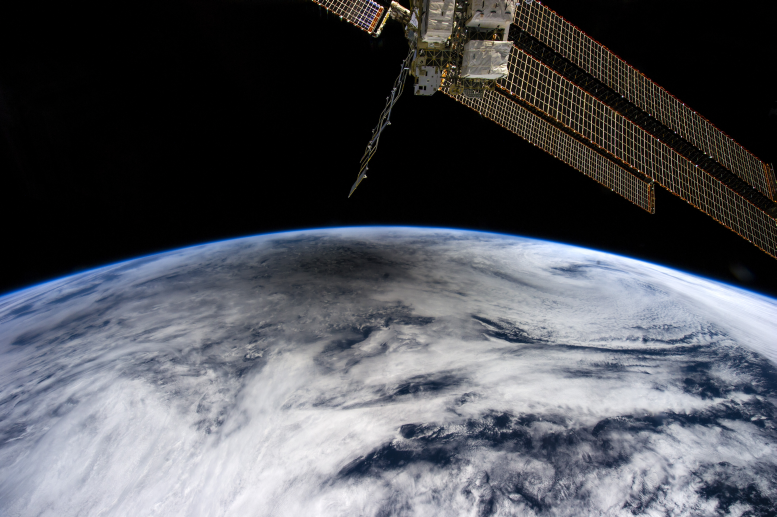 ISS will not see the Moon’s umbra on the Earth’s surface. ISS passes over the western United States and southeastern Canada during this pass. 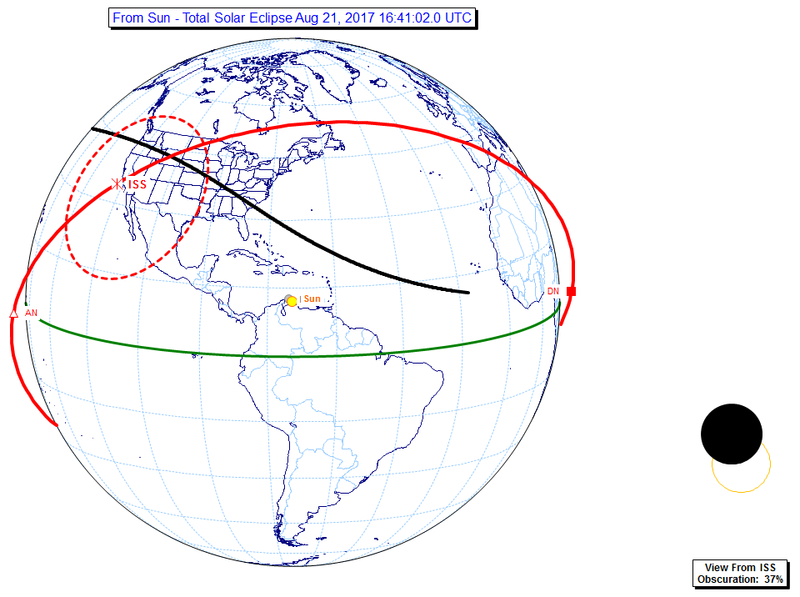 At the time of the figure (16:41:02 UT), the total portion of the eclipse has not yet started for the Earth. A partial eclipse is already in progress and is witnessed by ISS. Observing a total solar eclipse from Low Earth Orbit platforms such as the ISS is difficult though not impossible. The problem is that the spacecraft is traveling at 27,000 km/hr while the lunar shadow travels at about 2,500 km/hr and usually on very different intersecting paths. This means that at a minimum, ISS spends less than 15 seconds traversing the 100-km-wide lunar shadow even when the paths align in space and time. 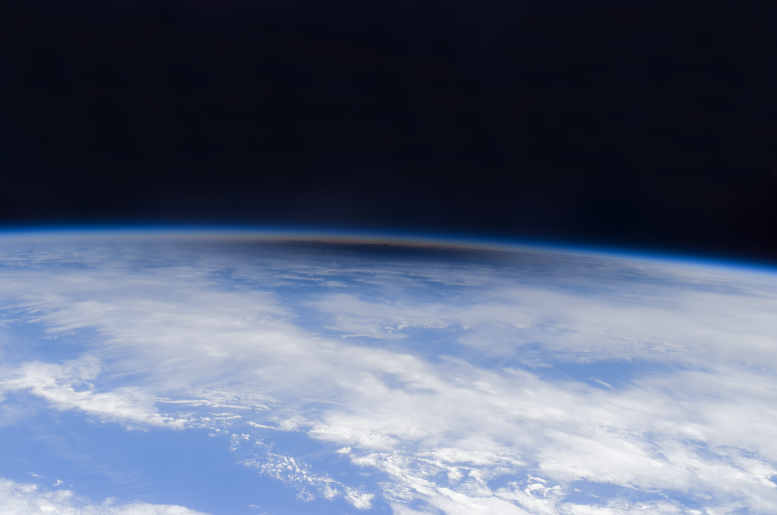 Luckily, partial solar eclipses occur several times each year and astronauts on the ISS have a 400-km vantage point, allowing Earth’s horizon to extend about 2,300 km from the ISS. This means that the ISS astronauts do not have to be right on top of the lunar shadow to see it and odds are usually very good that the ISS is over-flying an eclipse area. On December 4, 2002, the Expedition 6 crewmembers were able to capture the distant and highly elliptical lunar shadow shown in the image below. The dark area near Earth’s horizon at center frame is the lunar shadow obscuring an area of cloud cover. The space station was over the Indian Ocean at the time of the eclipse. More recently, Expedition 31 astronaut Don Pettit photographed the total solar eclipse of May 20, 2012. The smoky gray shadow of the moon is cast on bright clouds of the northern Pacific Ocean near the westernmost point of the Aleutian Islands. The eclipse center was about 1000 kilometers from the space station nadir position at the time of this photograph. Fischer has been honing his camera skills since arriving on the International Space Station in April 2017. He recently shared a view of the Milky Way. 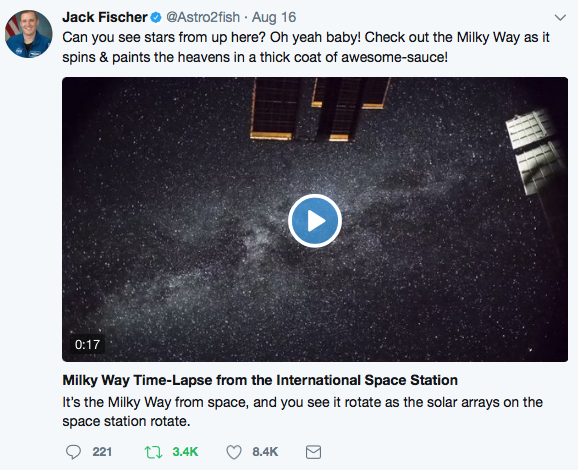 You can check out the time-lapse video by visiting his Twitter account @Astro2fish. The images and videos astronauts capture from the space station are visually beautiful, but there is also real science in the collected data. Astronaut images provide researchers with station-level views of Earth to improve knowledge of surface changes over time, along with dynamic events such as storms, floods, fires, volcanic eruptions and eclipses.